Established in 1877, the William Tell House is the oldest saloon in Marin County. Despite a devastating fire in 1920, the Tell House has remained a cherished community gathering place for generations and home to countless dinners, weddings, and celebrations. Located in Tomales, California on scenic Highway 1, the Tell House is just north of Pt. Reyes and minutes from the Tomales Bay Oyster Trail. The William Tell was named by Swiss brothers Arnold and Henry Dado in 1897, and takes its name from the Swiss folk hero and marksman attributed to the foundation of the Swiss Confederacy. While the details of the bar’s origins remain somewhat hazy, the building was founded in the late 1800s as a hotel and saloon and was operated by the Dado brothers for a few years. From 1869 to 1900, Clover Stornetta Dairy co-founder Arnold W. Dado leased the Tell House. In 1903, together with his wife, Maria, Antonio Matteri purchased and operated the location’s hotel, dining room, and saloon. 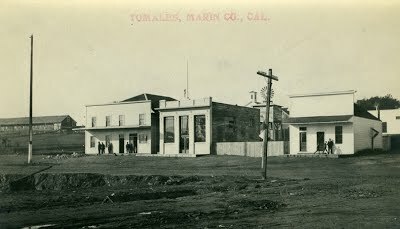 In 1920, the building burned to the ground along with several other surrounding structures in The Great Tomales Fire. One year later, the Matteris rebuilt the Tell House, designing the structure that remains intact today. After Antonio’s death in 1931, Maria continued to run the business herself. The Tell House remained in the family for three generations, and was owned and operated by the couple’s daughter, Edith Bonini, and later her son, Bill Bonini Sr.
Eighty-six years after his grandparents purchased the Tell House, Bill sold the building in 1989. The building passed hands once more in 1996 and in 2011, Marcos Pareas purchased the Tell House. Under his ownership, the restaurant and saloon were extensively renovated in an effort to restore their historic charm. In 2018, San Francisco chef and restaurateur Ted Wilson purchased the Tell House, bringing a fresh take to a storied California establishment. Today, Wilson and his team have updated the California destination to better reflect its 150-year history and the agricultural bounty of its West Marin location.